What we create with the heart; we build with the mind. 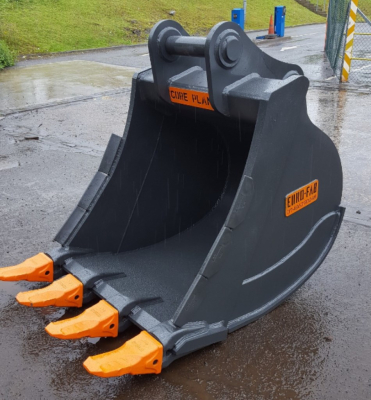 Our Riddle Buckets are manufactured to suit anywhere between 3 and 55 tonne excavator machines, with various sizes available. The spacing and size of the horizontal and vertical tines can be tailored to suit your requirements. These buckets are best suited to rocky soils. 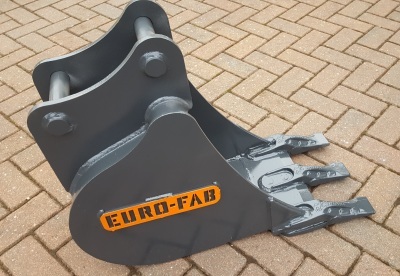 Keen Attachments riddle buckets can be customised in several areas, including gap width, backs (profiled or ribbed) and pins (either 'weld in' or 'on'), with Klac options also available. 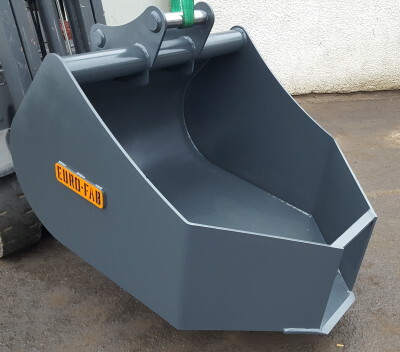 Our Rock Buckets are manufactured to suit anywhere between 13 and 125 tonne excavator machines and are fabricated with XAR 400 heavy steel plate to ensure they are both rugged and robust. They come complete with bottom wear bars, runners, rock teeth and blade shrouds. 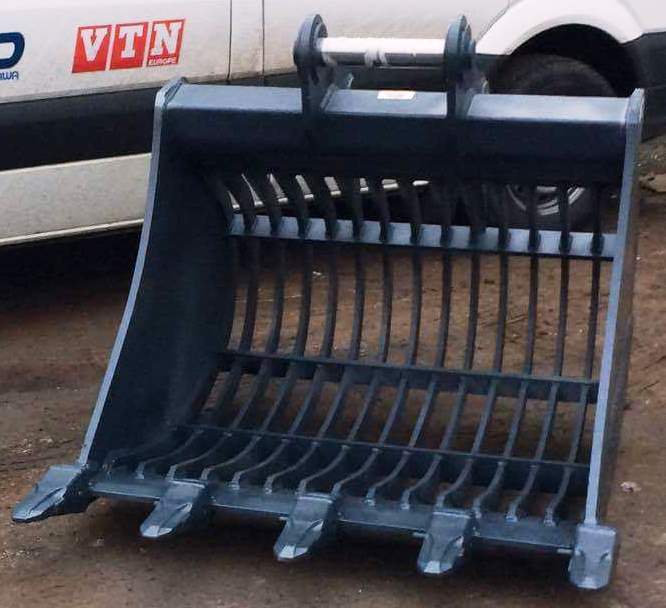 Our Digging Buckets are manufactured to suit anywhere between 13 and 125 tonne excavator machines. 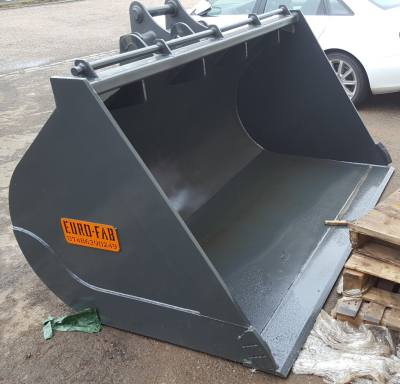 Depending upon the application we can offer either general purpose or heavy duty buckets, suitable for light and medium construction work as well as for use in more demanding excavating conditions. 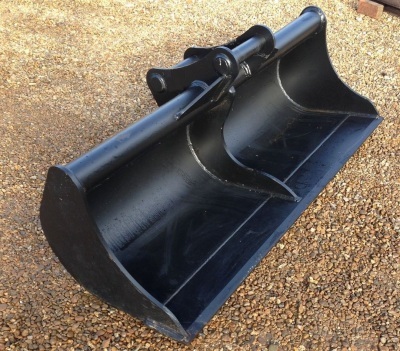 Our Ditching Buckets are manufactured to suit anywhere between 3 and 45 tonne excavator machines. We manufacture a broad range of buckets in all different sizes to suit your requirements. These buckets are best suited for grading, loading and general handling. In addition to our standard bucket sizes are listed below, we also offer a bepoke and customisation service where we build buckets tailored to your specification. Our Concrete Pouring Buckets are manufactured to suit anywhere between 5 and 20 tonne excavator machines. We can offer capacities of 0.25, 0.5 and 1.0 cubic meters to suit your requirements. These buckets are best suited for foundation pouring and road works. 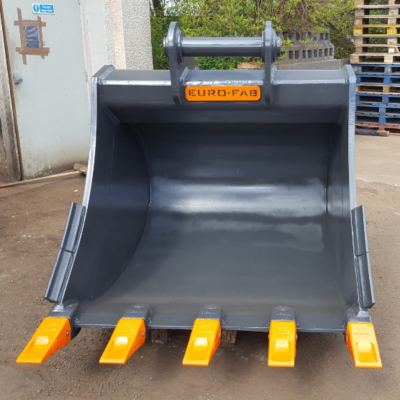 Our Trench Buckets are manufactured to suit anywhere between 1.5 and 8 tonne excavator machines. We manufacture a broad range of buckets in all different sizes to suit your requirements. These buckets are best suited for cable laying and general handling. Our Grain Buckets (tele handlers) are manufactured to suit a range of applications. Our general purpose buckets are ideal for construction and farming applications.